F278PFF was photographed two weeks after going on the run at Bala in 1988. One of three WrL's and an ET in the batch, the transport department at Bangor had not applied the crest. F278PFF replaced the only Bedford TK/HCB-Angus I had not photographed in the fleet. OCC922M was originally allocated to Bangor in 1972 and replaced Commer VA/Carmichael WrT BCC503C which was allocated to Nefyn which replaced a red Green Goddess. 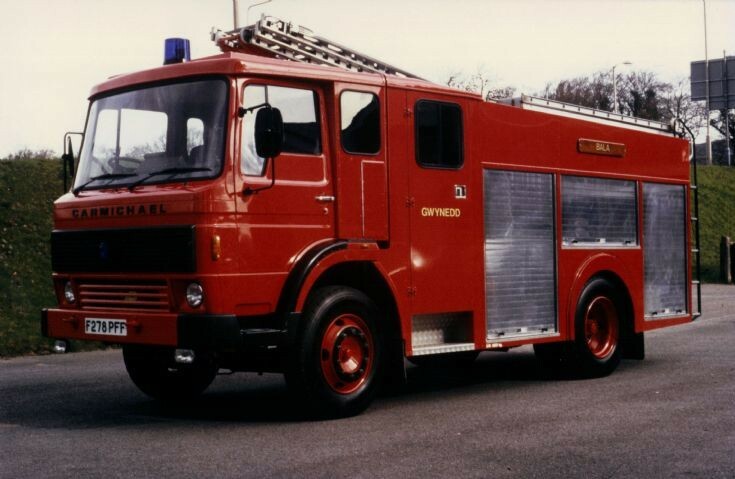 When Bangor recieved Ford D1114/Carmichael WrL's KJC729/30P in 1976, OCC922M was reallocated to Bala to replace Bedford S/HCB WrT CFF 162. LJC 31K left Bangor for Nefyn to replace BCC503C. F279PFF allocated to Pwllheli replacing Ford D1114/Carmichael WrL SEY166L and the ET was F280PFF for Caernarfon replacing a converted Bedford TK/HCB-Angus WrT MCC949L. If anyone can help with a shot of OCC922M I would be greatful. Added by Danny Jones on 22 May 2014.